Isn't it just like a venture capitalist to imagine that he's a super-hero, capable of saving troubled companies, forging strategic partnerships, and negotiating deal terms without breaking a sweat? The guys at Flybridge Capital Partners in Boston throw a big bash in Maine every July, and one of the highlights is a Saturday night costume party. The theme this year was "Heroes and Villains"... and you have to give the Flybridge team credit for going all out. 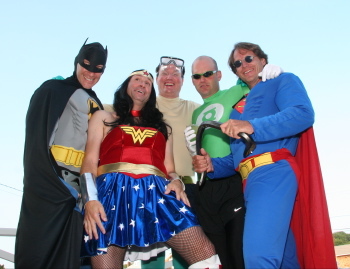 That's Jeff Bussgang as Batman, David Aronoff as Wonder Woman, Chip Hazard as Aquaman, Jon Karlen as the Green Lantern, and Michael Greeley as Superman. You can read all 2 archived comments over here.